played by Scott Bennett) but also a superb string sextet supplemented occasionally by a harp. is a very accessible yet distinctive musical voice, which these singers deliver with impressive conviction. opulent and spacious recording. In one word – lovely! powerfully delivered by these committed and accomplished performers. drama of the choral parts. without the McGlynn Celtic Mass), and the way his choir responds with such potent empathy for the music." has earned itself a strong reputation for being one of America’s most prestigious professional choirs." about it and that it is the expression of his deepest religious convictions. 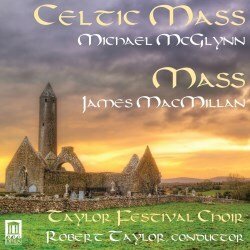 rightly place Michael McGlynn’s Celtic Mass and James MacMillan’s Mass in its wake." Scotland, coupled with his devout Catholic faith. settings of the Celebrant’s part —Sursum Corda, Preface, Eucharist Prayer, and the Memorial Acclamation. atmosphere of choral ecstasy. Fine choir in fine performances. Notes on the music and texts." extraordinary writing in the Gloria."